Using a cellular device is the most common ways to get online for RVers and Cruisers. There are many types of devices that can be utilized - mobile hotspots (aka Jetpacks or MiFis), smartphones or cellular embedded routers. Understanding the features of a specific device is almost as important as selecting the right form factor for your needs. These features can range from modem specifications, local networking capability, or options for enhancing the signal to your device. All of these factors can combine together to determine how well a device will work for you and the actual performance you are able to get out of it. As each of the cellular carriers continues to advance their networks, your cellular data performance will be directly impacted by how modern your device is. 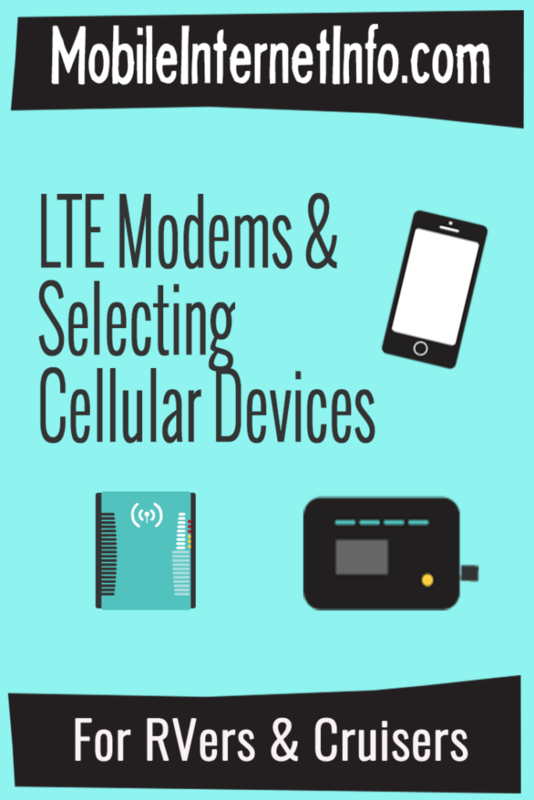 For those who consider mobile internet critical to their lifestyle, we generally recommend evaluating the cellular modems at least every year or two to keep current.